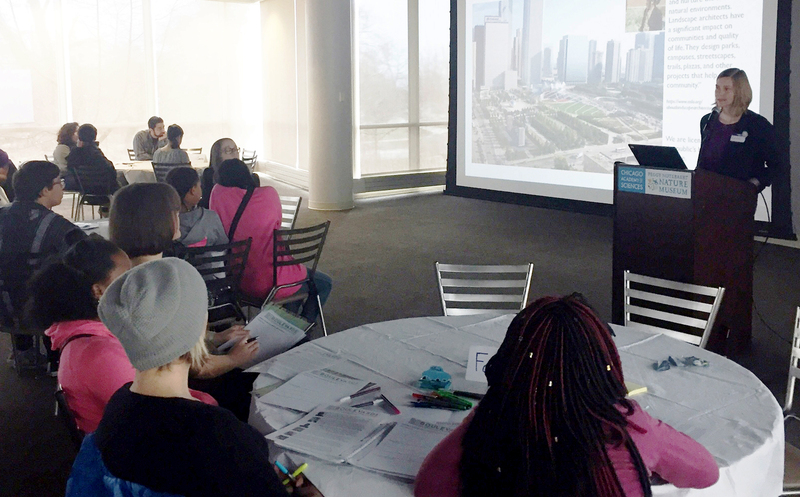 The US Green Building Council-Illinois Chapter (USGBC-IL), Civic ArtWorks and the Peggy Notebart Nature Museum teamed up to host Chicago high school and middle school students to re-imagine the historic Chicago boulevard system as it relates to a community asset near their schools. TGDA was one of six sustainability experts invited to present at the Symposium. TGDA provided the participating teachers and students with an overview of the landscape architecture profession, TGDA’s work related to the boulevard system, typical landscape considerations when designing a site, and inspired the participants to see the infinite possibilities of the boulevards. The students were excited about the idea of proposing a temporary intervention such as a food truck parade, permanent installations such as community gathering spaces and even looking to explore bus rapid transit opportunities. The student campaigns will be posted on the Your Municipal website to collect community feedback. The Top 3 campaigns will to be announced early May 2017 at the USGBC-IL Limelight Event. Good luck students!